Growing up, my grandma and grandpa lived about five blocks away from our house, and they had the best backyard. They had a big above-ground pool with a great deck, a little sandbox with an awning, a lovely fenced in garden, and both flowering and fruit trees. The yard wasn't big, but it was wonderful. One of the trees they had the most beautiful pink flowers in the spring, another tree had a trunk and branches that were perfect for climbing, but one of my favorite trees was the plum tree. It had delicate, thin branches with lush leaves, and the drops of ripening fruit were so temping. By the time they were ready to pick, the deep purple maroon color belied the green flesh underneath at just a few spots, and the blue waxy sheen was enticing. When they were barely ripe and tender we could pick them and eat them, but they were more tart than sweet - after a little longer, they were 'over-ripe' but definitely at their sweetest. My grandma used to slice them up and bake them on a yeast dough as a treat for us, and it was something I looked forward to every year. Pale flesh of sliced red plums. I have tried to replicate her recipe a few times, with varied success, so in the fall I usually just send up baking plums into simple crumbles or cakes, or I use them for cooking in savory dishes. Although Italian plums are definitely my favorite (I think it is a combination of taste and size mixed in with a little nostagia), I really love all plums including red and black ones. 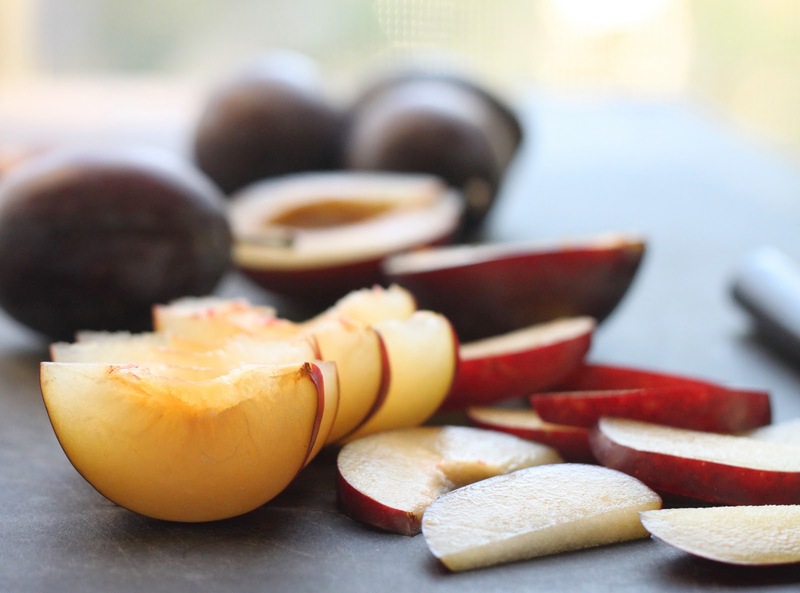 Red plums, sliced for baking into bars. This fall, I was tempted to do something else with with my plums - make crumble bars. I was inspired by a peach shortbread recipe that I tried from Smitten Kitchen last summer, and though I did like it, the bars didn't have nearly enough fruit for my taste. Not to mention, her recipe called for browning the butter, and although we can all hail queen Browned Butter, it didn't really do it for me in this recipe and just seemed like a fussy extra step. Then this year I saw a recipe for peach crumb bars with hazelnut streusel by my friend Dara from Cookin Canuck. The amount of fruit in her bars was definitely up to my standards, but she peeled the peaches before baking (and has a great tutorial on how to do it) and I really didn't want to do that much work this time. 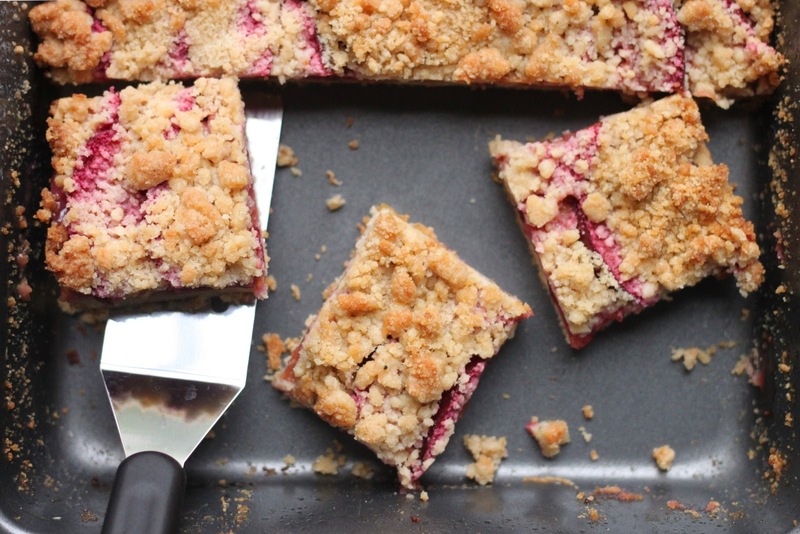 Plus, I love the way the skin of the fruit stains the crumble bars a deep pink color so I wanted to leave them on. In the end, I decide to work from both to make my own recipe, with two layers of different types of plums - Italian plums and red plums - and a crumble base and topping that was spiced with cinnamon, nutmeg, and allspice, and sweetened mainly with brown sugar. 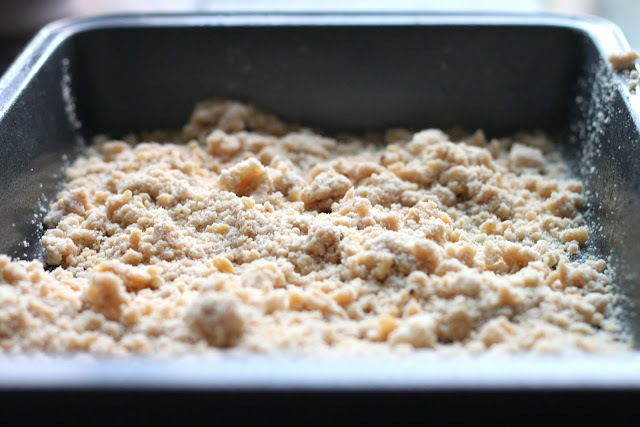 The spiced and sweet aromas of the bars baking was fantastic, and when I pulled them out of the oven to see if they were done the crumb topping was golden and the fruit around the edges was bubbling. I breathed a little sigh of happiness, and then put them on the counter to completely cool. Because you know, you aren't supposed to cut crumble bars until they are cool. Completely cool. So I called my sister, we talked about dogs and baking and boys (in no particular order), and I told her I was going to put the bars in the fridge to cool until the morning and I would slice them then. Even I was surprised at how good it was - the texture of the crumb and the cooked plums was melt-in-your mouth soft, but not so soft that eating required a fork. The flavor was just the right blend of spices and subltle, yet deep, sweetness from the brown sugar; but what makes them so perfect is that they walk the line of being 'not too sweet.' You know, that sort of dessert that makes you want to go back for seconds. And maybe thirds. But hey, thats ok, because fall has just started so plums will be plentiful for awhile yet. Plus, I am already planning to make another batch of crumble bars this weekend, so there is no chance of running out anytime soon. Preheat oven to 375 degrees Fahrenheit, and spray the inside of a 9x13 baking pan with non-stick spray. 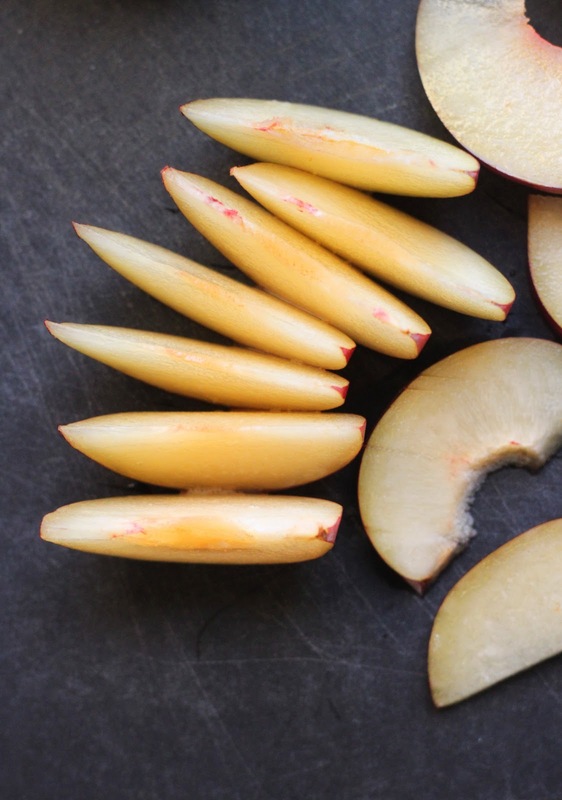 Prepare plums by slicing each around the equator, and then twisting to separate one half from the other - then remove the pit, and slice each plum thinly. Set these aside. In a large or medium bowl, prepare the crumble mixture by whisking together the brown sugar, white sugar, baking powder, flour, and spices. Then use a pastry cutter, a sturdy fork, or your fingers (I used the finger method), to blend the cold butter into the flour mixture. You want to evenly distribute it, but some clumps of butter will probably remain, and the mixture will be crumbly. 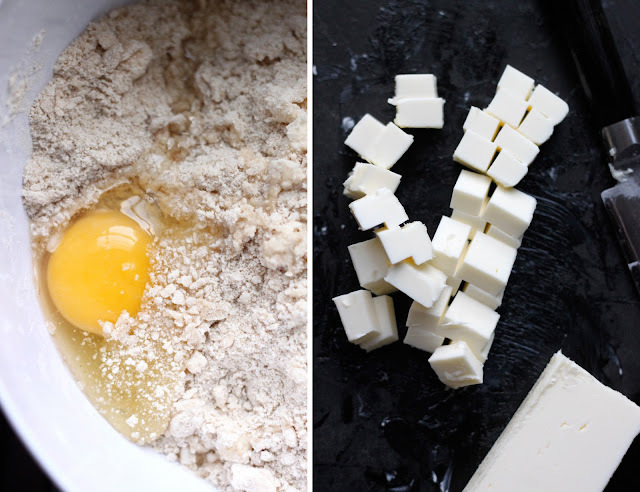 Then use a spoon or your hands to beat and mix the egg into the crumble dough. Make the bottom crust by firmly compressing about 3/4 of the mixture onto the bottom of the prepared pan. Next, layer the plums over the top of the crumb base - I did a layer of round plum slices followed by a layer of oval plum slices. Finally, scatter the remaining 1/4 of the crumb mixture over the top of the plum slices, without pressing it down. Bake the bars in the preheated oven for approximately 30-35 minutes, or until the top is golden brown, and the plums around the edges are just a bit bubbly. Cool the bars completely in the pan before cutting them - overnight in the fridge works perfectly for this. Cut into squares for serving, or into triangles if you feel more fancy. Keep refrigerated in an airtight container if not serving right away. I love bars and plums, so this recipe is for me! Wonderful. Yeah, I don't think I could resist these either! 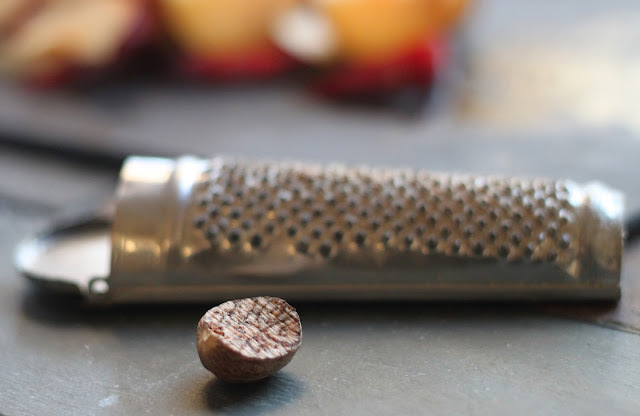 Plums are so delicious at this time of year and this is such a perfect recipe to use them in! my grandparents lived in northern california and we were in texas, so we weren't exactly neighbors, but i DO remember the plum trees and the delicious plums that we had with every meal. they still bring back great memories! Plums remind me of my grandma, too! She used to make the best plum jam. Your bars look fantastic. Gorgeous, gorgeous photos and bars. These look to die for! Saw your post on Foodgawker. I just want to say that your photography is amazing, and looks scrumptious! yummy, I saw this on foodgawker too! That looks superbly delicious! Holy cow I want these right now. They look incredible. oh my grandmom has a great backyard as well and love all the trees! Brings back memories. The bars look amazing! Wonderful pics to help narrate this wonderful memory of your grandparents. These bars look wonderful too! Not only am I FOR SURE going to make these- I wanted to comment on how beautiful the photography is! Thank you for this blog post! I don't believe that I have ever baked with plums before, but this definitely has me inspired to give it a try! Yum. those look wonderful. 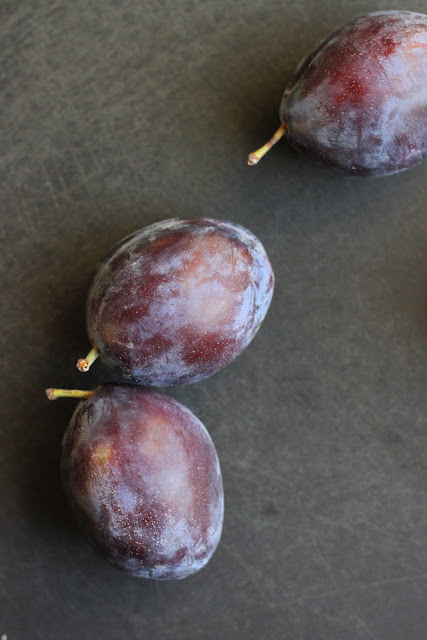 I love plums - and can imagine these would be amazing with peaches and raspberries too. Definately one to bookmark ! These are beautiful. 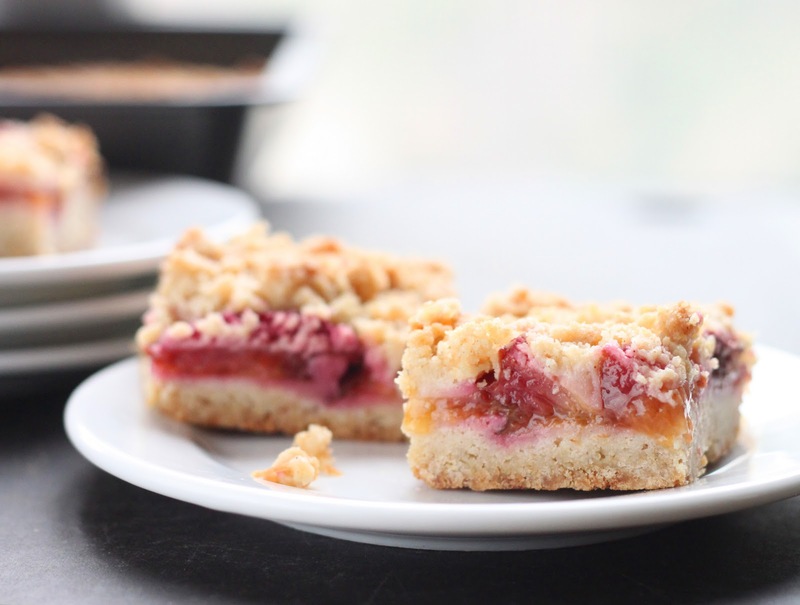 I love crumble bars and am especially in love with the fact that you used plums. These look wonderful, and I'm anxious to try them . . . but when do you put the egg in? Hi Beth! I just adjusted it - I feel silly that I forgot to write in about the egg, thanks for letting me know :P It is fixed now, happy baking! Let me know how you like them! Thanks for the recipe clarification! I made them when my family came to visit, and served them slightly warmed with a dollop of whipped cream --- they were delicious! These look absolutely phenomenal. Adding them to must make asap list!! Too bad we don't have the same produce seasons as you guys in San Francisco. I'm going to have to stock up on imported stuff at Trader Joe's. Wait, why did I think you were from San Francisco? Maybe 'cause that's where we met. Either way you guys get awesome produce in CA! Oh! these are simply gorgeous! I often wonder why plums are so underrated! 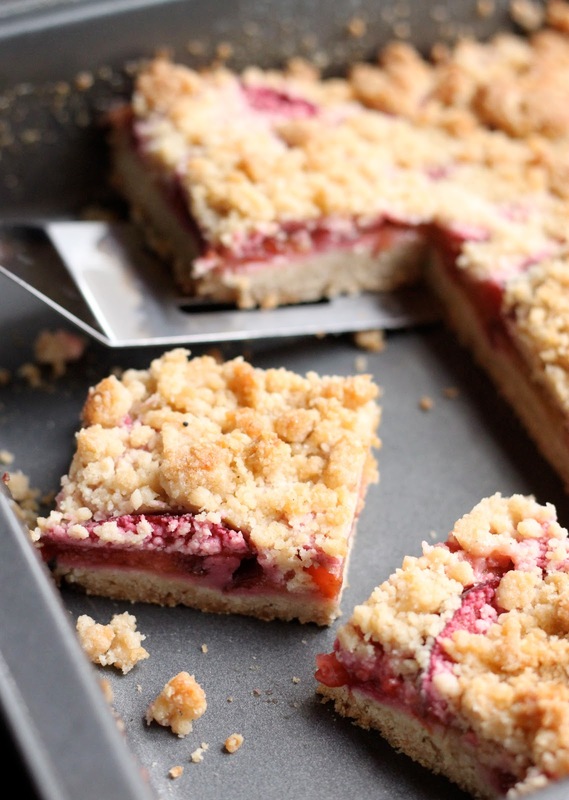 Probably because most folks do not make awesome looking crumble bars like these! These really look spectacular. this is the sort of treat I like in mid morning and afternoon. I bet these have a divine flavor to them. I know you haven't posted any new recipes in a while but I want to you know that I always refer back to this recipe in the summer. It's the perfect perfect PERFECT sweet treat for an office meeting or even picnic/party with friends. I don't know a single person that hasn't loved a slice. I've made this with peaches, nectorines and asian pears. Always amazing. لا تتأخرو ولا تبادرو بالاتصال فنحن خياركم الامثل والافضل .